Life has its moments... make them unforgettable with PANDORA jewelry. Mark the special moments in your life with these beautiful charms. Whether it is your first date, a day spent with Mom shopping, or just saying "I Love You", there is a PANDORA charm that will make the perfect gift for every special moment in your life. Charms Charms that combine the sophistication of PANDORA with the Magic of Disney. 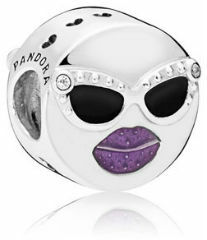 Silver Sterling silver PANDORA charms feature a wide variety of themes and designs. 14K Gold & Sterling Silver With a touch of 14K gold these silver charms stand out. Sterling Silver A variety of CZs and semi-precious stones set in sterling silver. Enamel beads combine sterling silver with a flash of color. A unique blend of metals, adding a warm luxurious look. PANDORA's 18K gold-plated sterling silver jewelry. Charms Featuring a precious or semi-precious stone for each month of the year. Glass A great way to add color and personality to your bracelet. From A to Z in two varieties: Sterling and Sterling and 14K Gold. Available in many finishes and styles, PANDORA clips lock into place on your bracelet. Use spacers to fill in your bracelet between your favorite beads. Nothing will look more luxurious on your bracelet than 14K Gold. Sports PANDORA charms featuring the logos of various professional sports teams. Numbers Dangling numbers to commemorate the special occasions in your life.